When his parents named him Herbert Lincoln James, they already had expectations that Linc would attend an ivy league university and go into politics. Linc didn’t. As captain of his swim team, he was expected to win the big relay to carry his swim team to the state championship for the first time in decades. Linc didn’t. Society expected him to walk past her. He couldn’t. 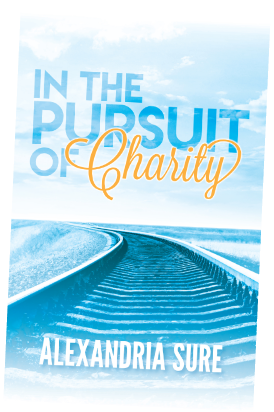 **In The Pursuit of Charity is a beautiful, refreshing and different romance story that we all can relate to. In a world obsessed with perfection. Ms Sure writes on a insecurity that most woman deal with weight. In The Pursuit of Charity is the first book that I have read from this author. Alexandria Sure writing style is superb, warm and engaging. **I loved the book , I couldn’t put it down. The characters were rich and dynamic, with deep emotions that pulled at me. I wasn’t ready to let these characters go at the end of the book, I felt deeply invested in their lives. Fabulous absolutely fabulous!!!!! **This was my first book by Alexandria Sure and I definitely enjoyed it. This book is technically not a cliffhanger, but feels that way when you finish it. This book does not have a HEA but it still leaves you with a lasting impression. I liked how this story shines light on a real problem in society. And that allowed me to relate more to the female character, Alexis. I could feel her resistance through her actions and it was very familiar to what runs through my own heart and head. I also liked that it was different because it was solely told from Linc’s POV and let you inside the male’s head for the whole story. I truly think everyone should read this story to just bring more light to the real problem, and well also because Linc and Alexis are amazing. ARC provided by the author in exchange for an honest review.